Here we are, waiting for Marion Barry once more. Word came down around 10pm that he would be hosting a 10:45pm press conference, with no topic known. It’s safe to assume it’s related to the incident on the 4th of July, and perhaps to the word that came out this afternoon that he had hired his ex-girlfriend and paid her $10,000 out of his council budget. We’ll have the press conference live here in just a moment. 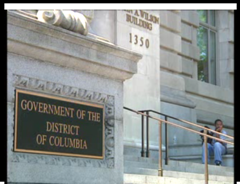 Spokeswoman: The events surrounding July 4th are not related to the awarding of the contract. Ms Watts was awarded the contract to administer the program in question was done so legally, and done according to council regulations. This was done in accordance with city policies. He gave her the contract (valued at $60,000) because he was concerned for her children. I don’t think either of those illnesses would undermine someone’s credibility.